Hospitals and healthcare networks are listening to their patients and delivering targeted, personalized communications. Personalizing the patient experience is a top goal for most healthcare marketers, and we're seeing the trends move toward new and unique ways to use data. Multichannel marketing campaigns, personalized automated reminders, geo-targeting for hospital marketing—these are just a few of the ways we are problem solving for our clients in the healthcare industry. How does it work? While there is no "one size fits all" approach for hospitals, we begin each client engagement with a conversation. What are your challenges? How can we solve your unique problems? Listening and then finding creative solutions is how we deliver better service—rather than selling a packaged commodity. Here we're going to show a small sample of the creative approaches and problem solving for our clients. Maybe you experience the same issues, or maybe your challenges are completely different. Allow these mini case studies to inspire you and get the creative juices flowing! Over the course of six years this campaign has been very successful. The pieces below represent each wave of the campaign: 1. New mover data, print materials embedded with PURLs 2. Eight versions mailed with different info based on zip code and targeting data. 3. Confirmation letter to those who respond. 4. Tracking reports back to the hospital that accounted for ROI of spend per family, and revenue generated per visit. Results showed that the response rate is high, and campaign spend is ~$5/family which generates on average ~$1,800/visit. Many hospitals and healthcare systems fail to send out basic reminders for appointments, but it is one of the best ways to use your data and get patients in for their annual checkups and visits. In this example, we set up automated postcard or personalized letter reminder campaigns for a savvy healthcare system. Their marketing team works with our specialists to create strategic campaigns that utilize data, automation, and robust printing capabilities. The sophisticated campaigns produce very good results for this client, which keeps them coming back to us with new ideas and challenges to solve. The automated postcard reminder campaigns send out notices by topic or condition, and they are targeted and personalized for each consumer. Using hospital data systems, we mail to homes and track down stream patient activity. 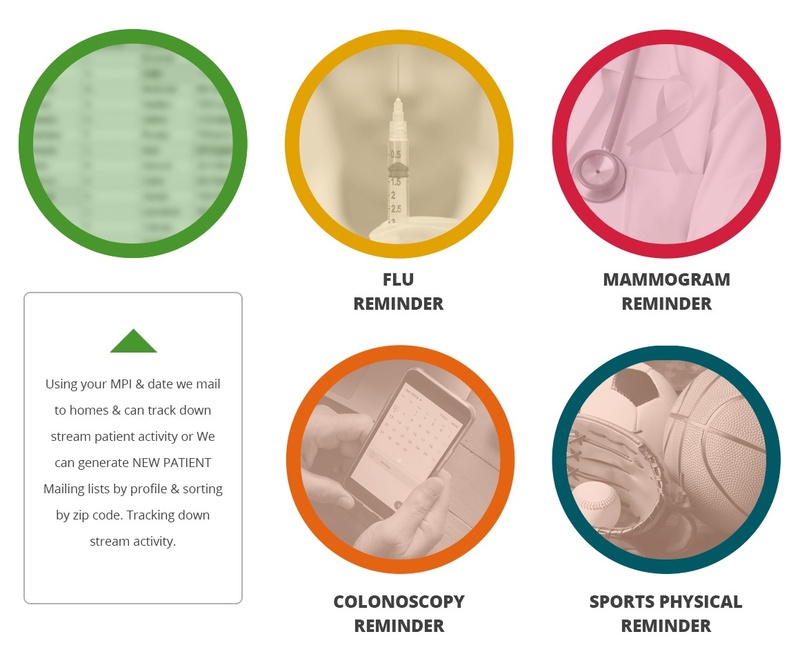 Or we can generate new patient mailing lists by profile and sorting by zip code, then track down stream activity. Our network of specialists can help your campaigns target the right people through the right channels, while remaining agile and responsive to your audience's preferences and needs. Integrated reporting tools allow our clients to effectively manage campaigns and utilize large volumes of data. Efficient data collection and handling enhances both current and future campaigns. Additionally, compliance reporting becomes more intuitive and seamless. We understand that in the healthcare field, there are serious repercussions if data is not handled properly. Our data security model is based on the pillars of confidentiality, availability and integrity of data, which provides our clients with the assurance that the highest standards of data usage are being met. Robust online tools—conveniently accessible on your PC or mobile device—give you the ability to centrally manage and control your print and marketing assets while delegating the work of placing orders where it belongs, out in the field. Complete pick & pack, hand assembly, machine matching, inventory and warehouse solutions are all in house. On and offline inventory / warehouse solutions are available. Our proximity to ORD Airport gives us convenient access to all the major air and land freight carriers. Elk Grove Graphics, a Vomela Network Company, has extensive experience and a proven record working with clients in the healthcare field. Contact us today to find out how we can help.